A Novel Cover Up is a semi-regular feature that looks at how covers are designed. 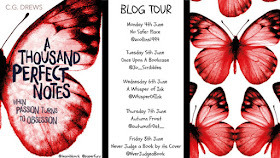 Thanks to Orchard Books, I have been fortunate enough to interview Book Designer Sophie Burdess about how she designed the cover for A Thousand Perfect Notes by C. G. Drews for my stop of the Blog Tour for this YA #LoveOzYA debut novel. Other than the cover, all images in this post are copyrighted to Sophie Burdess and used with permission. They can be clicked to be enlarged. 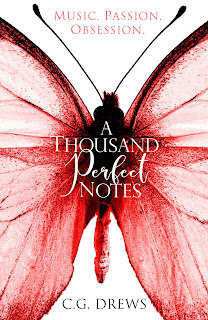 Can you tell us about the cover for A Thousand Perfect Notes by C. G. Drews? What do you hope it tells readers about the story? The book is emotionally hard-hitting: it’s both a story of violence and abuse but also of hope and coming to life, so I wanted to find a way to try to convey both to the reader. I hope the image gives a kind of visual punch - something violent and in your face, but also beautiful and fragile, to play with that tension in the story. With any luck the reader will also feel a contrast of the imperfect type and the ‘perfect’ in the title and get the sense that something is amiss. I settled on the idea of butterflies quite early on. They are a motif in the book and it really captured my imagination. I thought a lot about how perfect, ephemeral and fragile their wings are and how they evoke feelings of life, freedom and beauty. And also how people like to put pins in them and keep them in glass cases. It seemed an appropriate metaphor for how Beck’s mother brutalised Beck and his creativity. I thought drenching the butterfly in red gives it that unnatural, violent edge and also a bit like an x-ray or something to look at in a forensic way: all things that are in tension to the natural, delicate beautiful qualities of a butterfly. Likewise, I wanted the type treatment to be in contrast to the title itself: to convey imperfection and give it a human, spontaneous quality. 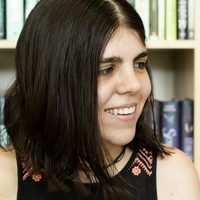 I was given a sample chapter so I could get a flavour of the tone and style of writing and an outline of the story from the editor, Megan Larkin. She also told me the story and what it evoked in her. Hearing it like this helps me get a sense of the emotions, textures, and images in the book. I asked her to tell me about it a couple of times to help me boil the story down to its essence - this is what I am usually trying to solidify in a cover. 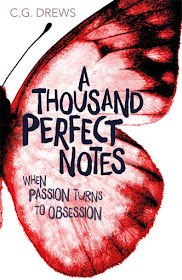 What went into creating the Thousand Perfect Notes cover? Can you tell us about the process? Who else was involved? After the editor and I talked about the book, and I felt like I had a good feel for it, I went off and played around with ideas on my own. A lot of this involved looking through pictures and listening to music that puts me in the mood of the book - just letting it simmer away and coming up with some awful ideas and throwing them away. Then once I had settled on the idea of the butterfly, it was a matter of looking through stock image libraries for existing images that would work compositionally and with the type. I tried lots of different approaches to the lettering to fit with the image and have the right tone. This was a real balancing act: too beautiful and perfect and it loses it’s tension, too playful and it trivialises the story. I like the simplicity and stark colour contrast of the image. And I like that it’s uncompromised: it got approved with hardly any amends or tinkering, which in my biased opinion usually makes for a stronger cover. Apart from the shockingly bad ones that I threw away immediately and didn’t show anyone? Yes! I played around with some variations on the theme: some with butterflies with a pin through their bodies, or broken wings but they were all a bit grim and felt to lean too heavily on the dark side of the book. I had some other ideas with piano keys but they were felt to be too descriptive and literal of the title - too much about piano playing and not enough about the broader, emotional themes. I also tried quite a few different compositions and typography before we decided on the single wing. Although I like the composition when the body is in the middle it doesn’t evoke the same fragility and the body maybe looks a bit freaky close up! When the type is very classic and beautiful as well, it didn’t quite hit the right emotional spot or hold the balance of fragile beauty and violence. When I first saw the cover, I was absolutely smitten! It's such a simple but stunning design. I'd tried to have zero expectations about it before I saw the first drafts, so I had no idea what to expect. I'm really glad I did that, because it turned into a lovely and satisfying surprise. The butterflies also fit beautifully since it's a line straight out of the book: "It aches in minor, like butterflies and broken wings." 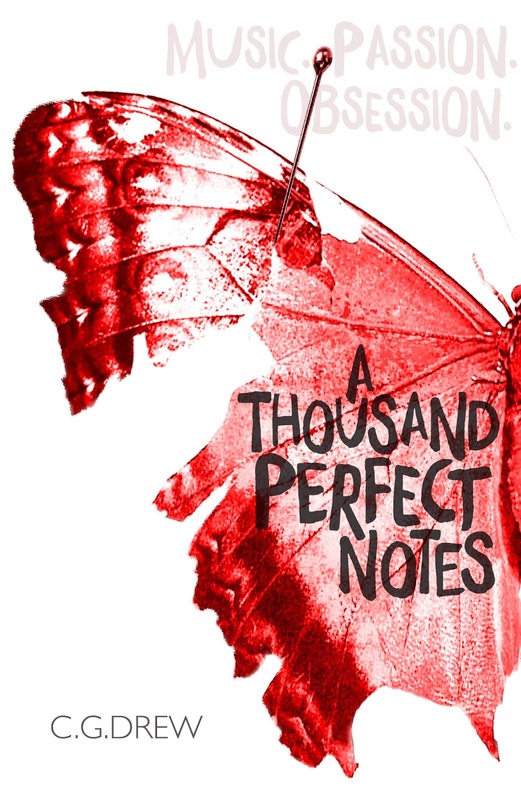 The red is also really applicable because A Thousand Perfect Notes is quite dark and deals with violence, so I feel the deep bloody red of the butterfly captures that so well. I'm so thrilled with the cover and the fantastic response from readers that it's gotten! I really love the final cover, but I have to say I think the final early draft is really beautiful, too. I love how the background of the second early draft looks like blank sheet music! But the final cover is brilliant! The red makes it look bloody and bruised, but it's also translucent, showing that fragility. Aah, I love it! Sophie has been working as a book designer for over 10 years. She has an illustration MA from Falmouth Art college and has worked for Hachette, Little Brown, Puffin, Walker and Quarto. She has been freelance since the start of this year, designing book jackets and illustrated books for a wide range of publishers. Be sure to visit Sophie’s website, C. G. Drews' book blog. Paper Fury, follow C. G. Drews on Twitter and Instagram, and check out A Thousand Perfect Notes when it’s released on on Thursday 7th June! And be sure to check out the other stops on the A Thousand Perfect Notes Blog Tour (click the banner to enlarge)! Great interview; thanks for sharing! I agree with Inge; it's always fascinating to see what went before the final decision. Love this! I think that cover design posts are fascinating, and I wish blog tours did them more often.